I wouldn’t be able to turn down a cookbook with Maren’s photos, either. Her work on Boulevard and the W-S Mexican cookbook is some of my favorite food photography of all time. Your gumbo pic is lovely — the okra is downright asian in its simple beauty. 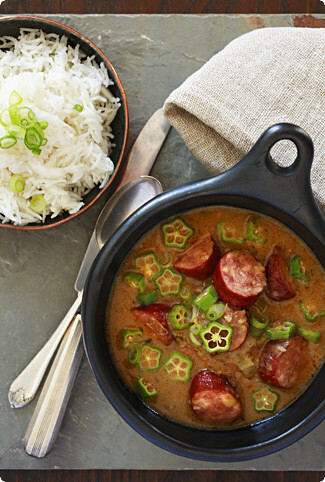 I don’t think I could turn down a cookbook either, you gumbo looks great and have recently come to love okra! 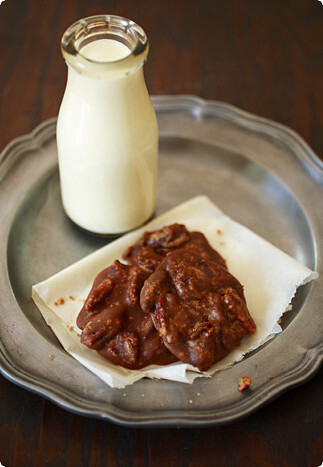 Also love your pecan pralines. 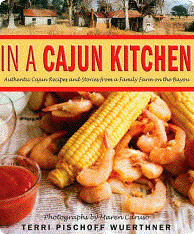 Very interesting info about the cookbook…..good choice on the gumbo……beautiful! I just came home from an an evening watching multiple episodes of "The Wire" with some friends. While I was there, I spotted a cookbook of Cajun and Creole recipes, sitting on their coffee table, and badgered them into letting me borrow it. I thought I’d just have a little look around here before going to sleep- and saw these recipes-for two of my very favorite things. There must be something cajun in the air. It all looks delicious-I’ve never tried making pralines myself-yours look just like the originals to me. Melissa,I made gumbo just the other night: <a href="http://seriouslygood.kdweeks.com/2006/09/gumbo.html">chicken, shrimp, and andouille</a>. Good stuff!And after reading your review, it sounds like I need a another cookbook. I think anyone would forgive you in view of the beautiful dish which you made. Whenever P. complains, I always remind him of how lucky he is to eat so well. It ends the conversation and I know I can buy more. Your photo is beautiful! That is one gorgeous gumbo! And the pralines. Ooh baby. I can almost taste it! I’m a big fan of Cajun food and have done a similar gumbo before. But this one looks and sounds better. Will have to try it. god knows i love me some gumbo! i’ve tried several recipes but i think the best one i’ve tried is on allrecipes.com and it’s called zydeco stomp gumbo!also, you can buy file powder off of http://www.seasonedpioneers.co.uk ! great as always, melissa. what kind of camera do you use for your shots? This is a refreshing site afte seeing Rachael Ray on television, her books in groceries over here in the U.S., in libraries and God knows where else. I dig this! The gumbo looks delicious, Great pictures Melissa. Makes me want to stir up a gumbo for dinner! Beautiful. Those are the most perfectly okra I think I’ve ever seen. You can’t cheat the roux on gumbo, but my Cajun friend from Opelousas (who’s repertoire of gumbos rivals the ones served at Prejeans) taught me a trick for etouffe he learned from his mama: dump 1/2 a can of cream of mushroom soup into your pot instead of making a roux. While it’s not pure, there is no taste difference. I´ve been saying no more cookbooks for so long, and with so little success, it´s a joke. Who cares, there are worse addictions, I´m sure! The gumbo looks and sounds so good. The picture with the okra, so beautiful. Can’t wait to try out the recipe. Thanks. Looks so good. I so love your writing style. Easy on my eyes. Yeah, I promised myself no more cookbooks, spend 40 quid this afternoon. Gumbo! Now that’s a long post!The gumbo looks absolutely delicious though. Melissa, what a stunning post and the gumbo. Oh, my! I want to try this so much. I need to find those sausages you mentioned.I love that okra is in it! Love okra.Gorgeous photos as usual. Anything with okra hits my list. Love the look of the pralines as well.